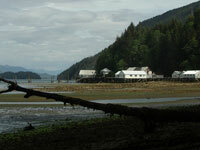 The pilings and ruins of old canneries dot the shoreline as I make my way to the head of Rivers Inlet. Like glimpses to the past, they stand as testament to the famed abundance of sockeye salmon that I only know through stories and data sheets. I do not know of days with so many fish. This journey to Rivers Inlet is at the invitation of the Wuikinuxv – the Oweekeno people who have lived with the rhythms of salmon for centuries. The Oweekeno know of such abundance. It sustained their families, their culture and their wildlife. It is in their bones. Literally. Today I travel to continue the efforts rooted in our shared concern for these fish. The sockeye fishery itself has been closed for more than 10 years. During this time it has been difficult just to meet the food and ceremonial needs of the Wuikinuxv People. They make difficult trade-offs between the needs of their families and the need for future generations of fish. 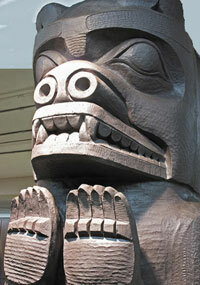 But this weekend is also about celebration – a potlatch for a passed elder. We begin the next morning in the kitchen at the back of the bighouse. Sacks of fresh clams are brought in by young men, deer meat and halibut are carried through the doors. Everywhere, people are placing their contributions to the coming meals. I have been placed with the salmon, breaking the sides of smoked and barbequed Rivers Inlet sockeye. I get my first glimpse into the deep connection between these fish and the Wuikinuxv People. I am honoured to be part of the feast preparation. As the day unfolds, I move back and forth between the front and back of the bighouse, trying to help with food, but not wanting to miss any of the dancing and ceremonies happening out front. Songs and drums carry the stories. Wooden masks, ermine headdresses, and traditional regalia adorn the Wuikinuxv. I watch the dances, listen to the speeches and feel the strength and struggle of a small remote community reclaiming the traditions that connect them to their land and their ancestors. I witness the incredible courage required to heal wounds that link the past with the present. I see emotion in their eyes and hear laughter in their voices. As dinner begins, I am struck by the beauty of the setting; tables with navy linen, candles and flowers line the wooden benches and the soft dirt floor of the bighouse. The fire burns in the centre as smoke and evening light pass through the smoke hole above. Rain patters on the cedar roof. The earth smells mix with the food smells as I sit down in my bare feet to a magnificent meal. When the potlatch draws to close, the guests are invited to the last dance. We are taken to the back and dressed in the aprons, robes and blankets used during the day. The women are given direction on the movements. As I step, the hooves and beaks swing and clatter from the bottom of the regalia. The soft dirt sneaks between my toes. The robe has transformed me. The drums beat through me. I feel what it means to be of the land. Before leaving, I meet with my Wuikinuxv colleagues on the Rivers Inlet salmon recovery team. My work is with the fish, but it is now hard to imagine the fish separate from the People, as I have seen the integral connection between the two. 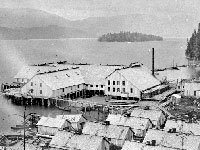 1) Wadham’s Cannery was one of the dozen canneries operating in Rivers Inlet during the first half of the century. 2) Goose Bay Cannery in Rivers Inlet, one of the few still standing, was the last to close in 1957. 3) 1.5 million sockeye was an average return to Rivers Inlet until the mid 1970s. 1100 gillnetters fished the peak of the runs in the 1950s and 60s. 4) Grizzly bear house column: This replication of a Wuikinuxv big house pole from Rivers Inlet stands in the Museum Subway Station in Toronto. Originals can be seen in Wuikinuxv village and the Royal Ontario Museum.